include the header socket for this EM-A1 option card. 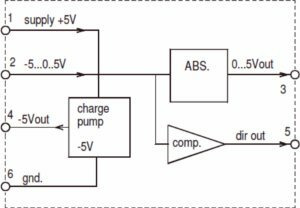 Also a symmetric potentiometer control is possible with EM-A1, as EM-A1 can supply negative voltage ( -5V ) for potentiometer. The negative voltage is usually made available from direction input terminal of the base card (option card EM-A1 plugged). Allthough EM-A1 option card uses +-5V as full control scale, the different base cards can have possibilities for even wider control input ranges like +-10V or even +-30V. The base cards input scale adjustment trimmer (attenuation) can then be used for adjusting the control scale to be suitable for the application.